We have received a statement tonight from Derbyshire Fire and Rescue Service on Tuesday's fire at Stone Lane in New Whittington (STORY HERE). "Following numerous calls from members of the public, at 11.49 hours on the 25th June, Derbyshire Fire and Rescue Service was called to attend a fire on Stone Lane, New Whittington. Fire Crews from Dronfield and Bolsover initially attended the fire with further crews from Clay Cross and Sheffield's Low Edges and Mansfield Road Fire Station attending to assist with a rapidly spreading fire. 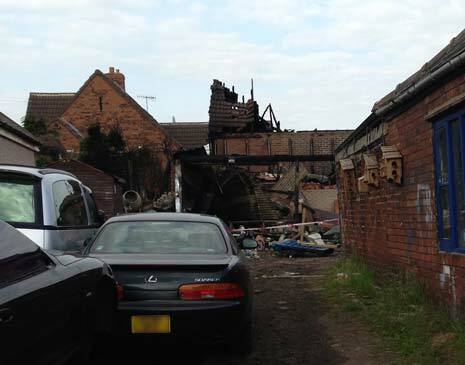 As a result of the fire, debris from an asbestos cement roof fell onto adjoining land (pictured above). 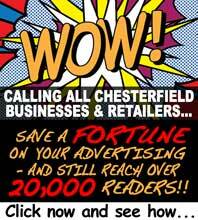 Chesterfield Borough Council is now assisting with the clean-up of this. As the fire was brought under control, officers from the Borough Council's Environmental Services Team began removing fallen asbestos cement fragments from the council's play area as well as nearby highways. The play area has been closed until the damaged netting has been examined and the area made safe. The council has employed an asbestos specialist to assess the local area for contamination and to advise on removal. Officers are working with landowners to ensure the safe removal of remaining asbestos. Local residents who find debris in their garden are asked to contact environmental health so that officers can establish the extent of fall-out and co-ordinate removal. The council have advised that the risk of harm to health from the asbestos is low whilst it remains damp and contained. Officers will continue to monitor the site to ensure it is dealt with appropriately." Councillor Chris Ludlow, Chesterfield Borough Council's Executive Member for Environment said: "Our environmental health teams are doing all they can to make the area safe for residents. "Residents who have any concerns should contact the council on 01246 345345."